When did breakfast become dessert? It’s post Pesach, and you’ve got a plan to start eating healthier. So let’s start with breakfast. Yogurt and oatmeal are healthy, right? [General Mills] Yoplait brand had transformed traditional unsweetened breakfast yogurt into a veritable dessert. It now had twice as much sugar per serving as General Mills’ marshmallow cereal Lucky Charms. And yet, because of yogurt’s well-tended image as a wholesome snack, sales of Yoplait were soaring, with annual revenue topping $500 million. This articles doesn’t even figure in the M&M’s or sugary granola Breyer’s Yo Crunch throws on top. 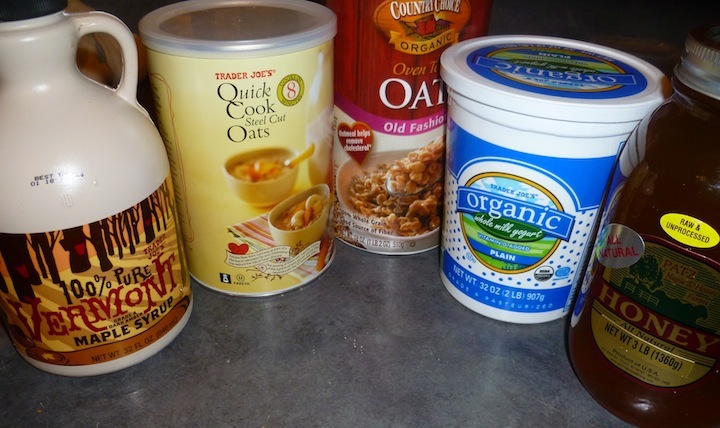 Flavored instant oatmeal is somewhat better when it comes to sugar content, but it can just as full of food additives, like food coloring and artificial flavoring. Oatmeal with dried strawberries? Think again. Those are apple pieces, dyed red and artificially flavored. In our house, I start my day with real food for breakfast. (My menu has the added bonus of being cheaper than the artificial alternatives.) I buy 32oz. containers of whole milk organic plain yogurt at Trader Joes and stir in less than a teaspoon of honey or real maple syrup. Then I top it with homemade granola. On days that I eat oatmeal, I make Steel Oats in a pot or plain instant oatmeal when I’m in a hurry. I add in wheatgerm so that it’s more filling and add less than a teaspoon of honey or real maple syrup. A breakfast of real food keeps me full until lunch.